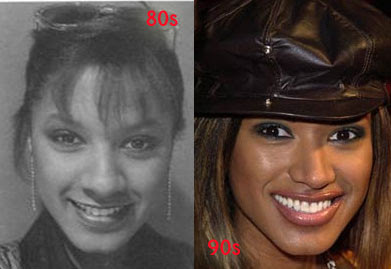 Traci Bingham before and after plastic surgery, nose job. In the past we've highlighted the plastic surgery saga of actress/model Traci Bingham, most notably her giant breast implants and over the top lip injections. And now we have yet another little nugget of plastic surgery proof which has recently surfaced, this before and after picture shows us Traci Bingham before her nose job. They really did a number on the tip of her nose, practically reduced the size in half. Stay tuned for future Traci Bingham plastic surgery updates, just call it a hunch.